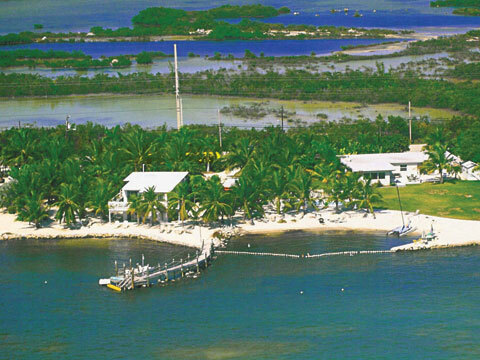 Location, Location, Location: White Sands Inn is located on Grassy Key at the edge of the Atlantic Ocean. The White Sands Inn provides the ideal vacation destination for any traveler. The Inn's 7 rooms, newly remodeled in 1999, are cozy and fresh with a view that is a vacation in itself. Choose from either a sleeping room or an efficiency to fit your traveling needs. The Inn's private beach and dock provide the perfect location for any waterfront activities, be it fishing, snorkeling, or bathing in the sun. Free use of peddle boats, kayaks, and row boat. Other amenities include: BBQ grills, tiki hut, private sandy beach, boat ramp, and tropical gardens. Come and stay with us for a day, a week, or a month. White Sands Inn, the perfect getaway! Inn Chosen for Fashion Shoot: February, 1998: New York photographer Doug Ordway chose our Inn for a fashion shoot involving models from across the states in a 12-page spread for the April '98 edition of Elle Magazine. THE TREE TOP TERRACE. Side views of the ocean This is a suite with two bedrooms, living room, full kitchen and private deck at the tree tops. There is a side ocean view from all rooms and deck. 1 bedroom having 2 full size beds. 1 bedroom with one king size bed. Living area having a queen size futon. 1 full bath. Full kitchen with a dishwasher, extra-large refrigerator with ice-maker, microwave, coffee maker and all dishes, utensils, and pot & pans. Private deck with table and chairs and BBQ grill. This suite has two color televisions with cable. *This room can also be a one bedroom suite having the 1 bedroom with two full size beds and the living area with the queen size futon.